He tried to eat the bathtub, but it wouldn't go down his throat! The nurse called the lady with the alligator purse! And I have no idea how the rest of the song goes. But what got that song stuck in my head was this super great find at the store the other day. Look what I got for $10!!! The bright green color is just the perky-pick-me-up that I needed! I am not a purse switcher. I am a devoted purse owner... if I love you, dear purse, I will be committed to you. I won't change purses to go with different outfits. Once I have found you, I will put my arm through yours no matter what I happen to be wearing-- even if it doesn't match and even if it clashes! Since you deserve honesty, I must confess that once your good looks have spoiled or you begin to weigh so much that my shoulder and neck begin to hurt, I will have to discard you. Never to be used again. So what are your purse habits? How many do you have in your closet? I had one that I enjoyed quite a bit, it was so cute, Like a berry apple redish color. A small handbag and it was stolen after the thief broke my window in the van. The kids began to pray for it to be returned while I was filling out a report with the officer. 30 minutes later, after discovering there were NO prints on the car, my father-in-law called my cell phone. He said someone found my purse. We called the man and he drove it to where we were and everything was still in it except for my datebook and makeup. I still have that purse. So yes, I guess I am loyal. What a GREAT bag! I have alot of purses in my closet and love them all and use almost all of them. I like unusual bags. Right now I'm carrying a very cute white tube bag. Wow, Lisa-- you got it back with just about everything still in it? That is awesome! And Bobo and Coco, y'all do have some nice purses (pursi?). But Bobes, I'm sure your purses are a little sad that you love your shoes more! I LOVE that purse. You might have to share with me where you got it because I might have to see if I can snag me one. :) My purse habits are sort of like yours. I find one I like and will use it for a VERY long time. Then one day I'll get tired of using that particular bag and decide to change to another one. If the one I've changed to does not satisfy me, I go get another one. I'm also the queen of cheap purses. I have a very hard time paying a lot of money for a bag. I LOVE that purse! It's fantastic. LOL I got the Christine's mixed up, sorry about that Christine and Coco! I got the purse at Marshall's on clearance. I have been looking for that color green all summer long but couldn't find it. My purse habits are just like yours. I will carry a purse long after it's intended life expectancy is over. I think I have one hanging in my closet. It's a really cute summer purse that I carried through summer and winter. I got tired of hiking it back up on my shoulder, though, and got one whose straps goes over one shoulder, across my chest, so I don't have to hold onto it. I still couldn't bear to get rid of the really cute one, though. Just in case. I've been using a diaper bag for almost 5 years now. I guess when the baby factory shuts down, I'll be able to start thinking about fancy bags again. I do have a simple black one (cheap, of course) that I throw my wallet and cell phone into, when my hubby and I go out on rare occasions without the children. This is a fun topic, by the way! yes and the officer was dumbfounded. It was quite a testimony though. Got to tell him how God answers prayer. Oh my, Brandy! What a fun site you linked to! Reminds me of all the fun hand clapping rockin' robin type of songs I learned in 2nd grade when I was bussed downtown. I am still lamenting the fact that I never learned how to double-dutch jump rope. Guilty as charged! I change my purse alot! I might have one for a day or a week. But all my purses were gifts or yard sale finds. I just recently got a Relic and a Villager for $.50 each! However I do have a really great red purse that a great friend splurged on for my birthday. That is the most expensive one I have! I have close to twenty or more! I love each one differently! very, very cute! i usually carry the same purse a long time, like 6 months or maybe even a year. I KNOW! but i have a hard time choosing new ones. i'm so picky. I agree with Christylahr--this is a super fun topic. We all seem to have the great inexpensive handbag thing in common, but I have to say that is one of the most obnoxious purses I have ever seen! LOL Ok, so fun yes, but I don't know if I could carry that around. Marsha, hats off to ya sista! You are a brave soul. I like my purses small, cheap (of course) and made of canvas or cotton or extremely lightweight fabric. Target and even Walmart will have lots of choices for ten bucks or less during the summer, so I get two or three at a time and make them last all year. And what's the difference between a purse and a handbag? hmmmm... thanks for a fun post Marsha!! I really like this site. Very cool! That purse is one that I would definitely fall in love with! Great find. Oh, by the way, Hi!! Purses...love them most of the time. Mine? Well I don't go for neato colors usually and if I do they are more of a casual cloth bag. I am also a loyal purse owner. I usual use the same one until it is worn out or I am worn out looking at it. Mine always seem to catch all my junk and my boys and my husbands. It's really the family catch all. Um, I refuse to answer the purse question...but you know what? I love that you are the lady with the alligator purse. So cute! Ahhhh, I do recognize that song from my jump rope days long ago. Now if I try to jump rope, well, it would be TMI! LOL! When I buy a purse it's because I LOVE it and will commit to it for a LONG time which is usually until it falls apart, poor thing. Megan, I never could use a canvas purse-- it would get waaay too dirty (even if it's washable)! I much prefer the wipe down variety. Tammy, we never sang that song as a jumprope song. While jumping rope, it was Miss Mary Mack Mack Mack... Cinderella dress is yellow, went upstairs to kiss the fellow.. and other ones that I can't remember. OK, let me just say...I LOVE THAT PURSE! What a great find. And GREEN is my absolute favorite color! I just transferred to a new purse a couple of months ago. Something a little more updated and funky - as my girlfriend said I needed. I am usually faithful to which ever purse I carry out of laziness. Who has the time to change purses with every outfit. I'm feeling blessed if I have enough time to schedule a bathroom break twice a day! But now, I must go and find myself a bright colored 'pick me up.' One that makes my heart sing! And I'm shopping today. 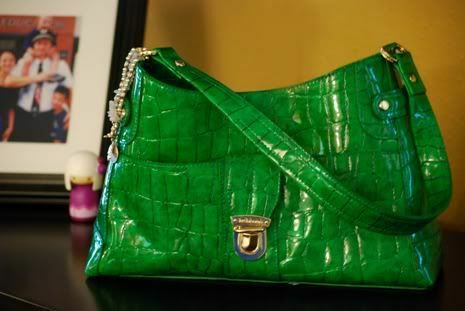 Who knows what I might come home with after seeing your beautiful green faux alligator bag! Hope you find something fun today, Hallie! I'm with you-- too lazy and too busy to change purses.